Tenebrae presents Joby Talbot's Path of Miracles, a unique and dramatic work inspired by the enduring Catholic pilgrimage to Santiago. Join former BBC Young Musician Freddy Kempf for a recital of Mozart. Martin Roscoe returns to Birmingham International Piano Festival, performing with Peter Donohoe. Fall in love this June with some magical summer night music. Pavel Kolesnikov joins us to launch the 2019 Birmingham International Piano Festival. We've put together some guidance and handy tips for attending events in the Barber Concert Hall. The internationally recognised ensemble Apartment House presents a new work by James Opstad alongside music by Julius Aglinskas and Lucie Viková. Outstanding violinist Ziyu He, teams up with Marie Hauzel for a Barber Evening Concert featuring Stravinsky, Bartók and Saint-Säens amongst others. We bring gospel tinged and folk inspired contemporary jazz to the piano festival in the final concert with the Sam Leak Trio. Benjamin Frith joins Department of Music PhD student Liang Shan for a rare performance of this Messiaen masterpiece. 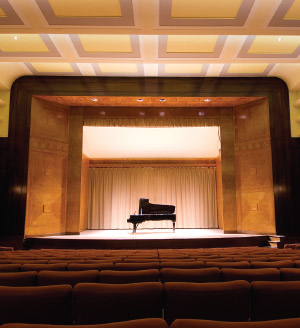 Professor Kenneth Hamilton and Steinway's Ulrich Gerhartz lift the lid on the Henry Barber Trust funded new grand piano in a lecture-recital on how to select a Steinway. Birmingham International Piano Competition remains committed to the art of the piano recital and gives young pianists the chance to further their careers and perform in world class venues. To include selections from George Shearing’s Songs and Sonnets from Shakespeare, and part-songs by Elgar, Holst, and Vaughan Williams. Join us for a lecture-recital from the Department of Music's new Director of Performance Ceri Owen and award-winning baritone Gareth Brynmor John. Internationally acclaimed Austrian cellist Florian Kitt and pianist Carlos Rivera-Aguilar perform Debussy, Friedrich Cerha and Prokofiev. The Callino Quartet join us to premiere the third instalment of John Woolrich's A Book of Inventions, alongside a new student composition and Mendelssohn's final string quartet. Follow us the latest concerts updates and news from the Barber Concerts team! CrossCurrents – Further information coming soon! 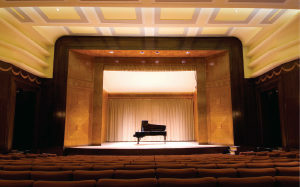 You can purchase tickets for Barber Evening Concerts at the reception desk in The Barber Institute of Fine Arts during normal opening hours, over the phone or online.